Here is a manipulative that you can cut out and use with your students or children. I like to use rhythm solfege as outlined in the video to demonstrate counting, but you can also simply count to 4. This is just one hands-on approach that you can add to your toolbox. I colored the squares simply because children like color. I included a black and white version too, which will be cheaper to print. You can always color them with crayons if you want. I recommend printing them on card-stock, and laminating, if desired. It may be tricky on the print-out to see where the cutting lines are, hopefully this illustration can help. Enjoy! Great idea! Thanks for sharing. Do you think This may be better than teaching them 'semibreve has 4 counts. minim has 2 counts, etc and having them clap the counts? My son started off in a music group with this and pretty much memorised them but doesnt always clap them right always. But it seems that doing it this way sort of builds the rhythm into them. I did learn the piano but I'm not a music scholar. This really helps. Cant wait to try this out! I'm sure my son will like it but I hope he doesnt get confused or discouraged. Would appreciate some advice on this. This is a fascinating way to approach this. I've not seen this as a vertical thing, only as a horizontal approach. How interesting! Have you found success with this? I'd like to try this with my students. Would you be alright if I borrowed your idea, modified, and printed my own. I like the idea of separate colors but I don't like the idea of making lots of these with my color printer. I think that if I rearrange what you have here I could just print several separate things on different colored papers. 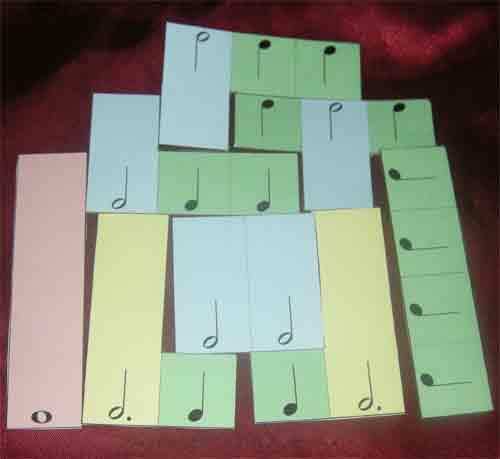 Have you thought about what you'd do with eighth notes? Sixteenth? Great ideas! Can't wait to try this stuff! © 2011 Tamsyn Spackman. Awesome Inc. theme. Powered by Blogger.